I’m reaching out to you because you’re based in California, and California Assembly Bill 178 is threatening to drastically impact affiliate publishers and the affiliate industry. Similar to what happened in New York state last summer, AB 178 is proposing to amend Section 6203 of the Revenue and Taxation Code. In a nutshell, the bill changes the definition of a “retailer engaging in business in this state” to include any retailer that works with affiliates in this state where the gross receipts or sales prices is over $10,000 per year. Feel free to read the entire bill online here: https://www.leginfo.ca.gov/pub/09-10/bill/asm/ab_0151-020/ab_178_bill_20090202_introduced.html . Several large affiliates and affiliate managers within California are planning to visit the Capitol in Sacramento for a legislative day on March 31st. I will be in attendance, as well we are looking for publishers to join in the effort as well. I’m not sure exactly where in California you are located, but if you’d be willing to attend these meetings in Sacramento, please let me know your preferred contact information so I can pass it on to Karen Garcia of GTO Management, who is organizing the meetings and appointment times. Please help in this grass roots movement to stop CA AB 178 and protect the livelihood of the affiliate industry. Thank you! Earth Hour – places are going dark. Friends on Fire – map where friends – powered by fire eagle works on facebook. Win Passes to Banned Movie Night! Citizen LA is giving away two pairs of tickets to Banned Movie Night taking place this Saturday, March 28th at the Downtown Independent Movie Theater in Downtown LA! Reply to [email protected] by midnight tonight and we’ll put you into a random drawing for passes, which will get you and a guest into the show (with a free popcorn) & the after-party this Saturday! Make sure to include the words “Get banned!” in the subject line. Winners will be notified by email tomorrow at noon. Join BMN in presenting a curated showing of Titicut Follies, a seminal, long banned documentary on the degradation of the mental health system, shown at the New York Film Festival in 1967 and then banned by our government until 1992. After the film premier, join Citizen LA, BMN and KCRW’s Mathieu Schreyer (Resident DJ: Bar Marmont, Hyde) as the party moves to the rooftop patio. Live DJ and full bar sets the mood for mingling under the stars. Proceeds benefiting Doctors Without Borders. Fargo fights red river rising. Record flooding in Fargo North Dakota. The river appears to do the same thing every two-three years. It’s so unreal that the river is rising so fast. It’s now snowing there and that will not make matters any better. At 6am PST, Bluehost appears to be down. The lines are jammed and several sites hosted on different servers hosted by BlueHost are down. I’ve been becoming increasingly troubled with the way BlueHost handles hosting and support. It may be time to move several accounts off of BlueHost. BlueHost is becoming like Ipowerweb and Startlogic. I have complained about this several times. They are just getting way to big to really respond and care. At this point I am not the only user having trouble a simple twitter search reveals that there are many others having the same trouble. This past weekend I met the folks from Gotein. They had a booth at the health and fitness expo for the Pasadena Marathon. The powder comes in a packet that your into a water bottle shake and drink. I tried the chocolate flavor it was actually pretty good. Other flavors include vanilla and strawberry. Gotein™ Protein to Go, has been formulated to not only provide quality protein along with 24 essential vitamins and minerals but it has been carefully taste tested as well. All the protein & vitamins will do you no good IF you don’t want to drink it. We think that once you try it, you will be hooked on the ease of Gotein™ as well as the great taste. So we are offering a Sample Pack of 6 sticks (2 Vanilla, 2 Chocolate and 2 Strawberry) so you can try it for yourself. We are convinced that once you “test the water” with Gotein™, you will be hooked! Gotein™ Protein to Go!, helps refuel the body, and improves lean muscle mass while burning fat. * Perfect for the sports minded person that needs to perform at their peak while exercising or playing a high energy sport. Also great for those on the go! Each packet is .952 oz or 27 grams. To order go to www.gotein.com or call toll free 877.3.GOTEIN. The sample pack is free. However their will be a $5.00 shipping and handling fee. Learn on YouTube with the just launched Education video content from 2-4 year universities and colleges. Thank you for your interest in adding your educational channel to YouTube EDU. At this time we are only accepting qualifying two- and four-year degree granting public and private colleges and universities, though welcome interest from other educational organizations. New channel sign-ups and additions to the YouTube EDU directory will be on a periodic basis. Thank you for your patience. RepairPal.com was featured on NBC LA this morning. David Sturtz designed the site RepairPal.com to do it all. Supermediastore – Weekend Sale! – Rock Bottom Prices! The White House is open for questions. We invite you to participate in our community-moderated online town hall. Submit your own question about the economy and vote on submissions from others. We also encourage you to include a link to a video of yourself asking your question (ideally 30 seconds or less), but text submissions are all you need. Come back on Thursday to watch the President answer some of the most popular submissions live at WhiteHouse.gov. UPDATE: The online town hall will be at 11:30 AM Eastern, the voting will close at 9:30 AM. 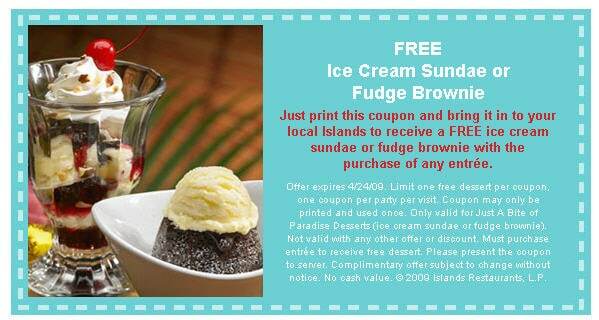 Islands has two new desserts that are perfect to satisfy your sweet tooth. Just the right size for one person to enjoy. ICE CREAM SUNDAE – Two scoops of vanilla ice cream, chocolate syrup, mixed berry sauce, whipped cream, diced almonds & a cherry. FUDGE BROWNIE – A rich fudge brownie served warm, topped w/ vanilla ice cream. Last night was the Craig Newmark interview at the Arclight. Just received my package of scentsational soaps. Love the scent. Cool Citrus Basil and Cool Breeze both are for good for men. The soaps are all handmade. Ingredients: Glycerin Soap Base, Mica Powder, and Fragrance Oils. Thanks to Toushonta Hogan, President. The soaps are made in the LA area, Redondo Beach. Are available for purchase online. The soaps appear to be poured into a plastic shell for packaging. I wonder of they are also available in loose form, without the pastic shell. The plastic shell is good for shipping and packaging. Maybe it is a green friendly package. If you are looking for a way to download audio mp3 files from a MySpace profile. File2hd can download audio and other files from a myspace profile. As some of you know I love salsa. I recently purchased Bella Foods salsa & marinade – medium sals. It was really good and I wanted to share with you. The salsa is made in Glendale, CA 91206. No preservatives or peanut oil. Bella Sol Salsa & Marinade is our tried and true 75 year old family recipe. It is a healthy and fresh alternative to the traditional sals. Bella Sol is committed to using the freshest ingredients for the most unbelievable flavor. Our salsa has become a popular topping from baked potatoes to eggs. Using our salsa can be as simple as adding a cup of it to cooked rice, basting with it instead of using butter or even marinating chicken or fish. Our salsa contains a variety of antioxidant vitamins such as lycopene and potassium. So add some spice to your life and eat more salsa!